Not only that, but he scored a ClimateProgress post all to himself when he couldn't tell the difference between growth and growth rate. And a SourceWatch entry. Now he's really hit the bigtime with a HotWhopper entry - but it's not all for himself. Ice age comethers are a dime a dozen at WUWT. Almost all past agricultural and cultural collapses occurred during “little ice ages,” not during our many global warm periods. Now I don't know if that's right or wrong but I do know that the way things are going, humans will never have experienced a global warm period like the one we're heading towards. The blue line in the chart below covers the period since civilisation. The red line is what's projected over the next few decades. Probably before this century is out. The danger is the cold, chaotic weather of the “little ice ages” themselves. That will shrink agricultural zones and shorten growing seasons. Another such icy period is inevitably coming, though not likely in the next two centuries, if past cycles are an accurate guide. Regardless, for the next 20-25 years, humanity will likely be in another cooling period, caused by the sun’s reduced energy output and the Pacific Decadal Oscillation. We are about 150 years into the modern warming. 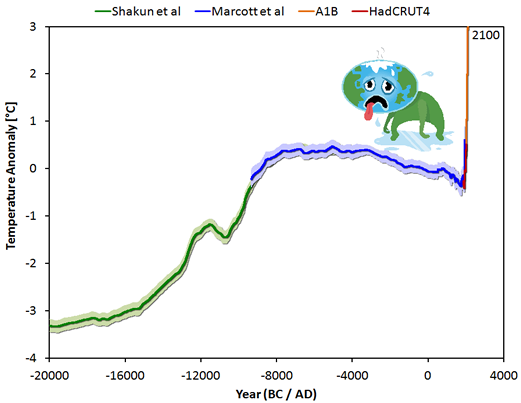 Since the shortest of these warm periods during the Halocene was 350 years, and they generally last 350 to 800 years, it is unlikely that we will enter another Little Ice Age for a couple more centuries. That's it. He's doing climate by numbers - and not very useful numbers at that. He thinks that there are some sort of long term cycles lasting between 350 and 800 years - which is a nice wide margin for him, isn't it. He offers no evidence for his claim and it's not one I've ever come across before. He's wrong of course. We aren't due for a major glaciation for around 50,000 years and as for mini ice ages, only if there's a few supervolcanic eruptions or an all-out nuclear war. It was Anthony's own article that was senseless, not the fact that seas are going to rise quite a lot. He didn't manage to make much sense, as usual. I've written enough about his fantasies on that score already (such as here and here and here and here) so I'll send you over to Tamino's excellent take down. Before you go - or afterwards, if you want to see a couple of very good videos about sea level, try these two. That sounds about right. But at the moment we have a group of people who are determined to blame everything on too much Carbon Dioxide in the atmosphere. I suspect the North Atlantic will freeze over and this group will still be trying to assign it to Carbon Dioxide. The reality is of course that these people belong to an interesting cabal who are anti any form of carbon based energy and instead would prefer to have half the population of the planet freeze to death whilst trying to use so called renewables. Indeed their thinking is so odd that they would probably prefer it if half of the population froze to death. Do these people actually believe the ice caps could melt while the temperature remains far below freezing even with the 3 degree worst case projection ? It appears that only the dumbest portion of our population are hired by the media. Your graph cracks me up. I've seen remarkably similar graphs for 'projected returns' from investment scams. Seriously though, I hope he is wrong about a cooling period... I'd much prefer a warmer world rather than a cooler one. Graphs used in scams are much more credible than the one Sou put up, so I rather doubt you have seen such. Scams depend on credibility. The temperature graph is accurate. Pretty incredible, isn't it? But not nearly as incredible as an ice age comething in anything less than thousands of years. What, "Skeptikal"? Never seen a hyperthermal before? That's what happens when you crank up the amount of GHGs in the atmosphere. It's basic physics, which you appear to be denying. "Specifically, in a 1998 article for the Wall Street Journal, he claimed the Centers for Disease Control (CDC) had conducted studies showing that eating an organic diet carried an 8-times the risk of E. coli infection than eating a conventional diet. Despite the fact that the CDC had never conducted any such testing, the Avery article was widely quoted." Why anyone could take what this guy says seriously is beyond me. Regarding civilisational collapse, the correlation is with water, not temperature. Which makes perfect sense since every civilisation depends on agriculture and agriculture depends on water - the right amounts at the right time. When that goes awry you get famine in the short-term and civilisational collapse on a decadal scale. It really doesn't take that long. A minor nit: unless he's moved lately, he's long been at the Hudson Institute, not Heartland, although they certain cross-fertilize on occasion. He is on the Heartlandf Senior Fellows list, with a bunch of other people, some of whom work for Heartland and some of whom really have other primary affiliations. His *primary* affiliation has long been Hudson, here's his Web page there. Indeed, AU is poorly-provided with such PR agencies/lobbyists, whereas we have many, of which a large fraction (including Hudson) happen to be located within a block or two of Washington DC's K street, not the cheapest real estate. Forget about carbon, clearly we need to limit our emissions of sodium. And crack down on big salt, making a motzah by making tasty tasty snacks, but ruining our health in the process.